Food Production Secretary Hayden Spencer, front row, fourth from left, and Environment Secretary Kwesi Des Vignes, fifth from left, front row, pose for a photo with Environment Programme Officer II, Environmental Management Agency, Gillian Stanslaus third from left, from row, and environmental officers were received their instruments of appointments on November 2, from left, front row, Shivonne Peters, Aleisha Simpson, Jenise Kirk, Terrence Holmes, and in back row, from left, Kirth Mc Pherson, Kirwin Sampson, Garth Ottley, Darren Henry, and Robert De Matas. 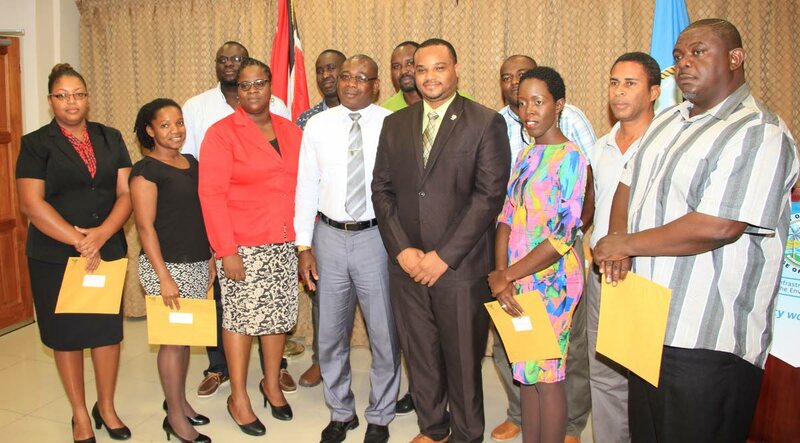 Empowering Tobagonians to become stewards of the environment and respect the laws created to protect it is critically important to environmental management, Environment Secretary Kwesi Des Vignes told nine environmental officers who were presented with instruments of appointment on November 2. Under the Environmental Management Act, environmental officers, who have responsibility for natural resources and forestry, now have the authority, among other responsibilities, to effectively implement the “policies, laws, regulations, rules, guidelines, programmes and other activities designed to protect and conserve the environment” and to function on the behalf of the Environmental Management Authority (EMA) as agreed. Those receiving instruments of appointment included Garth Ottley, THA representative on the EMA board; Shivonne Peters, Aleisha Simpson, Kirth Mc Pherson, Kirwin Sampson, Jenise Kirk, Terrence Holmes, Darren Henry and Robert De Matas. Des Vignes said the main issue with environmental protection was being able to influence human behaviour and to raise the consciousness that the health of the environment was inescapably linked to human life, security and Tobago’s economy. Greater emphasis on education and empowerment was required, beyond the fulfilment of the letter in the Instruments, he said, as he urged the officers to attend to environmental management with the energy and innovation required to make a difference. Reply to "Instruments of appointment for 9 environmental officers"